AOSOM bike trailer offers a comfortable and safe ride for children. It can be used for up to 2 children, and can be quickly converted to a stroller without using tools. 20-inch big wheels ride easily across uneven terrain, and a universal coupler attaches quickly and easily to most bikes. 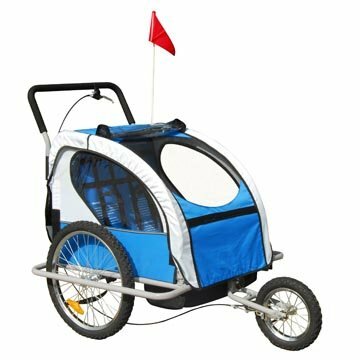 This 2010 New version AOSOM bike trailer/stroller also comes with improved hand brake system with lock, so when you use it as a jogging stroller, you can lock the brake when the stroller is not in motion. Features: ? Frame - Lightweight and strong. ? Made by Steel. ? Made for two children, but also can be used for one child. New hand lock brake system on the rear wheel, so the jogging stroller can be locked when parked. ? ? Ultra smooth-rolling 20" aluminum quick release wheels ride easily across uneven terrain. ? Sling seat w/ 5-point safety harness - Extra security and comfort for passengers. ? Fits in the trunks and storage areas of most vehicles after folded. ? Converts to stroller in seconds w/out tools - Convenient - no need to carry tools (conversion kits are included). ? Bike Hitch/coupler is included for connecting the trailer with bike, it also fits bike with quick release wheels. ? 2-in-1 weather canopy - Helps protect kids from sun and rain. ? Rear storage area - Extra room for parents to carry items. ? Age limit- 18 months or older. ? Max Weight Limit: 100lb. ? Assembled Weight: 37lb. ? Brand: AOSOM. Dimensions: ? Full Dimension: 55*36*42 inch. ? Folded Dimension: 32*27*9 inch.